We were scared. The threat of Russian attack on our country was real - underline “real.” The Cold War was never more cold than it was in 1960. 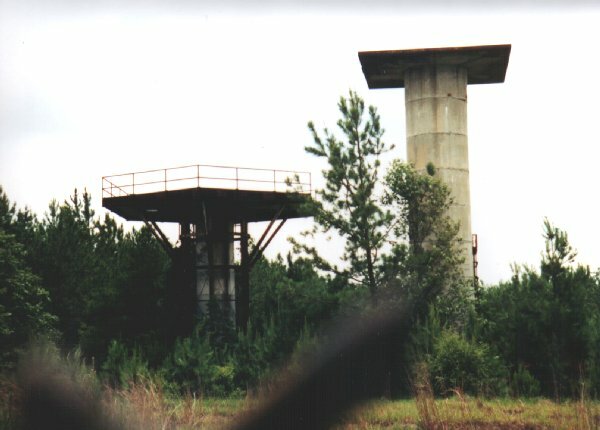 Sitting right near the center of Middle Georgia was the Air Force base at Warner Robins, which would have been a prime objective of an attack on the southeastern United States. 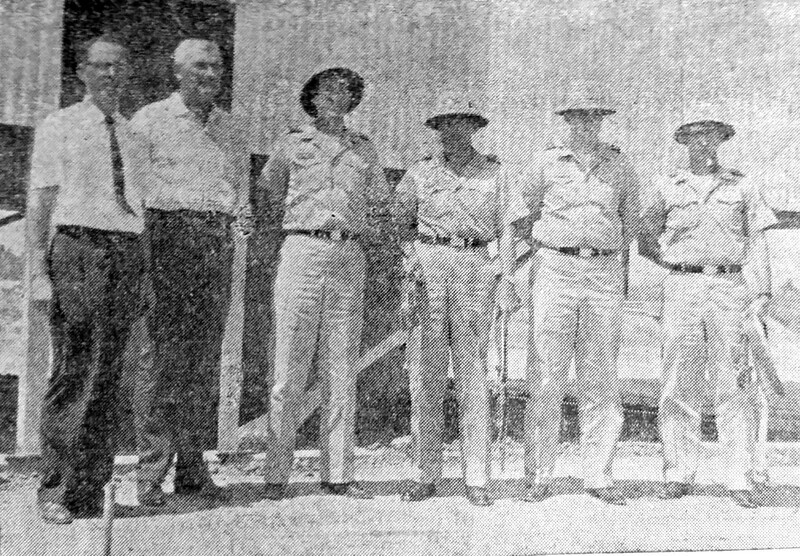 Local governments were establishing Civil Defense departments in case of a land war or nuclear attack. It was the days when a Nike was a missile, and not an athletic shoe. The Air Force set up a defensive perimeter around Warner Robins. 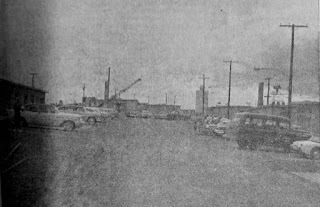 One early warning base was established near Byron and the other five miles south of Jeffersonville. The eastern base was built in 1960 in Twiggs County just off Highway 96 about a quarter mile northeast of its intersection with I - 16 at Exit 8. The mission of the bases was to detect an incoming enemy missile or plane and to shoot it down with their batteries of Nike missiles. 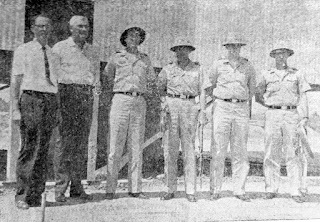 Left to Right ROBERT WILLIAMS, Oconee EMC, F.J.PERRY.Oconee EMC, .COL.T.C.GRICE.CAPT.NELSON.GAGNON.LT.DONELON.SFC. Col. T.C. Grice was the 4th Missile Battalion Commander in charge of the Byron and Jeffersonville bases. Capt. Nelson G. Gagnon was in command of Battery A at Jeffersonville. Lt. Ludwig Wegemann was assigned as the executive officer. SFC Lucian Muniz was in charge of the mess hall. 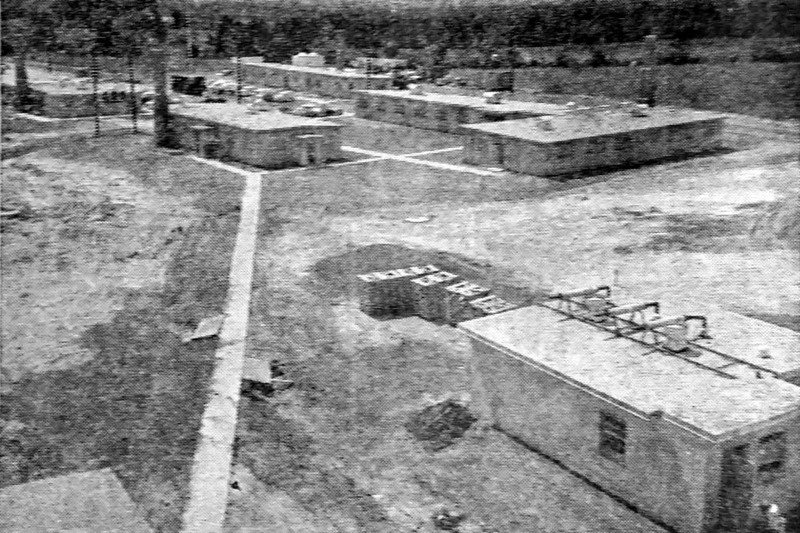 The base was staffed with five commissioned officers, four warrant officers, and thirty-one enlisted men, all of whom were specially trained for their duties. Capt. Gagnon estimated that it cost $100,000 per man to train the men at the base. 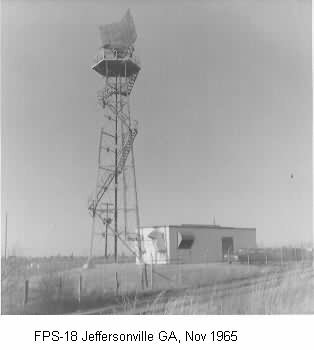 The unit was attached to the 61st U.S. Artillery which had its beginning in 1808 and fought in every war since then. 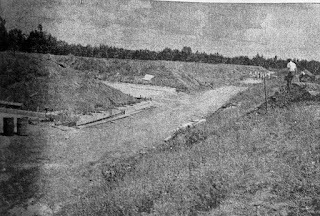 Army engineers transformed an abandoned Twiggs County cotton field into a state of the art missile battery. Heavy wire fences were placed around the installation. Vicious guard dogs and sentry were placed at strategic locations around the periphery. 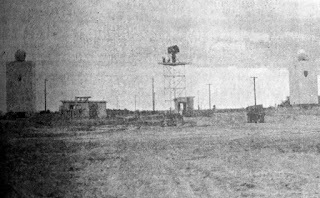 Three radar towers were built. The first two determined the range and direction of the incoming target, while the third synchronized the flight of the missile toward the target. Base officials estimated that it would take about fifteen minutes to fire the missile after learning of the enemy target's approach. The Nike missile had an effective range of seventy-five miles with a maximum altitude of twenty-five miles. 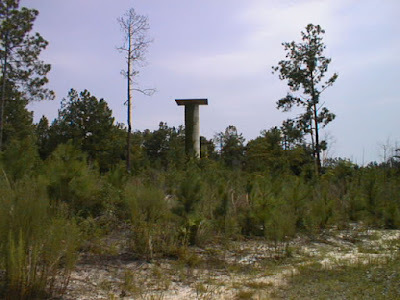 Six large launching pads, each eighteen inch thick at their base, were constructed a short distance to the northeast to house the missiles. They were stored in the horizontal position, two to a pad. Before firing, the missiles were hydraulically lifted into the vertical position. Final electrical checks would be made and the crew would retire to the concrete and earthen bunkers. The bunkers were designed to protect the crews from the tremendous heat generated as the missiles rose into the air. The Nike was chosen for the base because of its low cost. The missile was guided by remote control and did not carry expensive instruments on board. The missiles were not stored in underground silos because they were constructed to protect the interior parts from the extreme temperatures of Georgia summers. 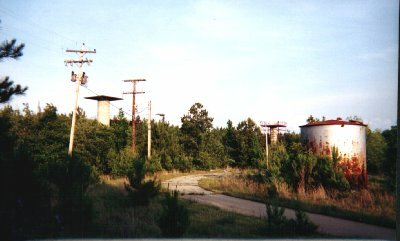 Each missile pad was controlled from trailers located nearby. In the event of an attack, new missiles could be readied for launch with no adjustments to the controls. The base was not responsible for detection of an incoming enemy plane or missile. The Air Force would make the detection and alert the base. A single invading plane was never to be targeted as the Air Force could stop one plane with air to air missiles. The base remained on yellow alert at all times. In the autumn of 1962 during the Cuban Missile Crisis, alert status climbed. Remember, the threat was all too real. Once instructed by the regional command in South Carolina of an invasion, the base would go on red alert. 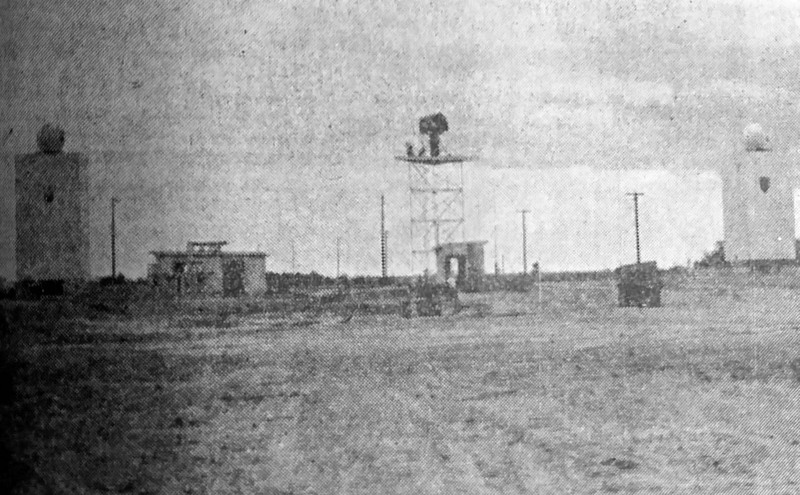 Then the three radar towers would be activated and the incoming plane would be targeted. The order to fire would come from the President or the higher-ups in the Pentagon. The final determination would come from the base commander after an evaluation of the totality of the circumstances. 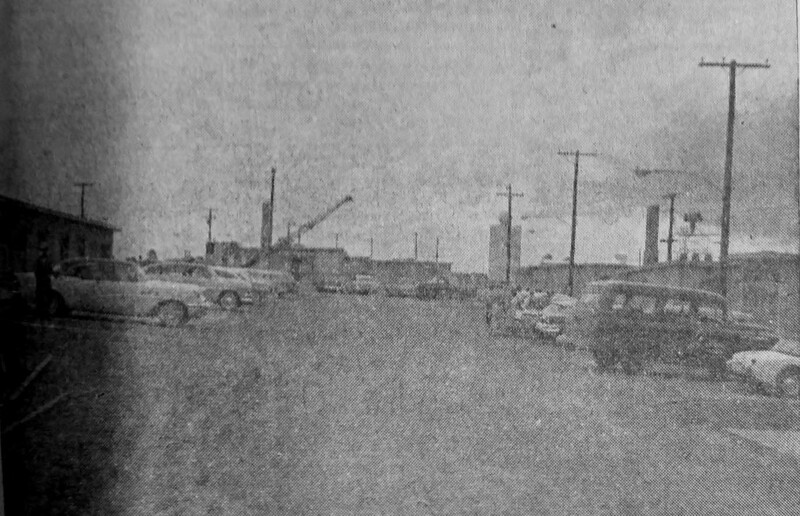 The main street of the base was known as Battalion Street. In this area, known as Area 1, were the administrative buildings, officers barracks, non-commissioned officers barracks, the mess hall, headquarters facilities, craft shop, and the supply rooms. The only thing to remind the soldiers that this was an military facility was the K.P. duty. The rooms were furnished with pictures and the tables were decorated with tablecloths, napkin holders, and flower arrangements. The chairs were painted red and carried the colors of the artillery. 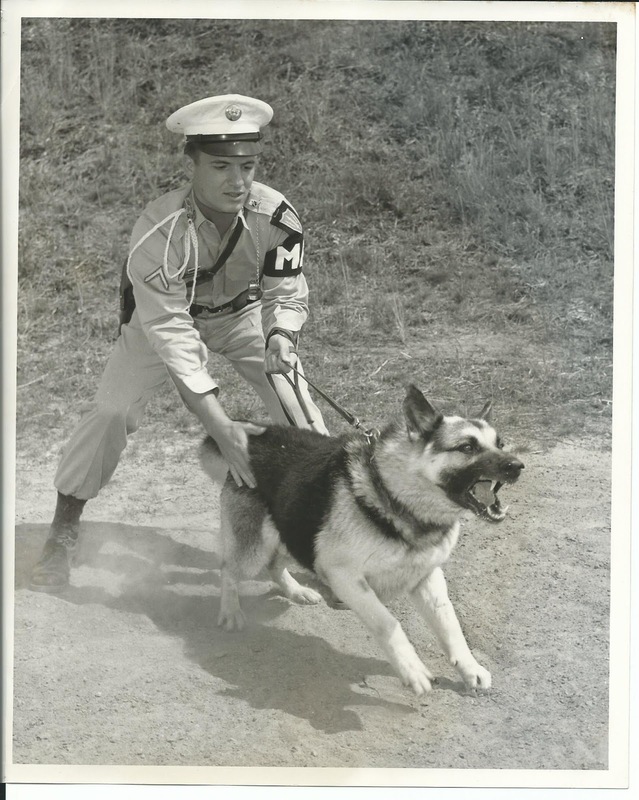 Despite the "homey" atmosphere, military discipline and decorum were followed at all times. Shoes had to be highly shined and placed under the beds. Some of the women in Twiggs County volunteered their time to sew on buttons for the men, make curtains and do other little jobs to make the facility a nice place to live in. The facility was totally self contained. Housed in a building on base, three generators were on standby in case of a commercial power failure. 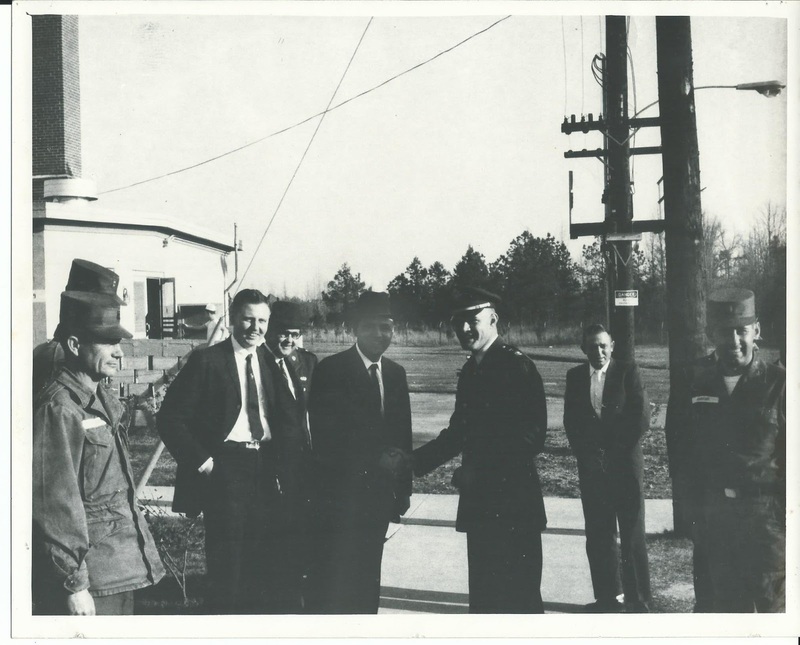 The Oconee Electric Membership Corporation helped in coordinating the power supply to the base. There were storage rooms filled with food and supplies in the event of a major crisis. The people of Twiggs County welcomed the soldiers with open arms. The children were sent to the county schools and the families quickly became a part of the community. Fathers Raphael Toner, Leo McCarthy. 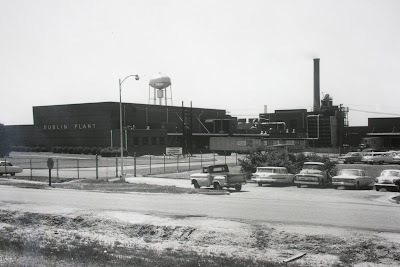 Ralph Frisch, and Myron Bateman based out of Dublin’s Church of the Immaculate Conception, presided over early Sunday morning mass at the site from late 1962 until the base closure in 1966. Because of inclement weather, the dedicatory services were held in the Officer’s Club at Warner Robins Air Force base . The featured speaker was General Robert J. Wood, a future four-star Army who helped to create the North Atlantic Treaty Organization (NATO) a decade before. As the commanding general of the Army's Air Defense, Gen. Wood proclaimed, “The military in our nation has never been stronger.” General Wood further insisted that the base was designed to be defensive in nature and never offensive. Mercer's wife Pat recalled, "We lived in off base housing and two Air Force Officer’s wives lived near us. 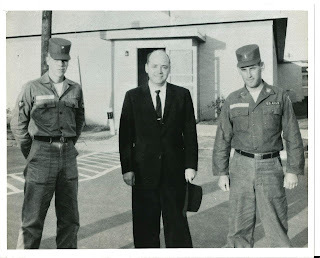 They took me under their wing during the Cuban Missile Crisis because Steve was on duty full time. 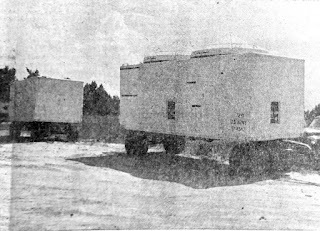 The Nike unit was a mobile unit with trailers to haul the missiles. Steve received malaria shots. We received evacuation orders and I kept the list of do’s and don’ts for evacuation with me at all times. My ‘orders’ were to head for Perry and to have a car full of people. I kept my box of required emergency supplies in the car…don’t remember all the items but flashlight, blanket. 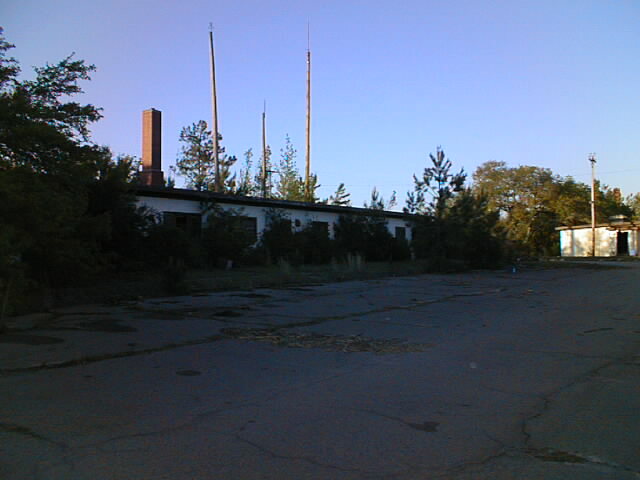 The Dudley School was designated as the evacuation hospital. Steve’s mom taught there at the time and she had no knowledge of their designation." 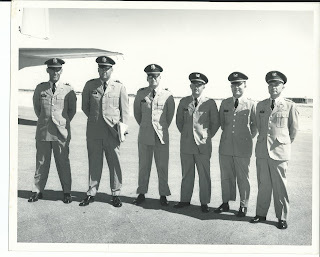 Pat Mercer recalled, "On the picture above Steve at White Sands, Steve is on the left holding brief case. This was part of the group going to White Sands for training. White Sands II. Capt. 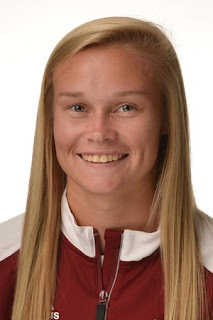 Wegemann has moved on and Capt. Curtis Hoglan. 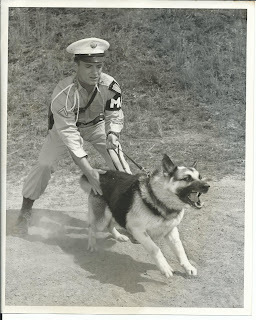 In the picture, Steve is on left, Capt. 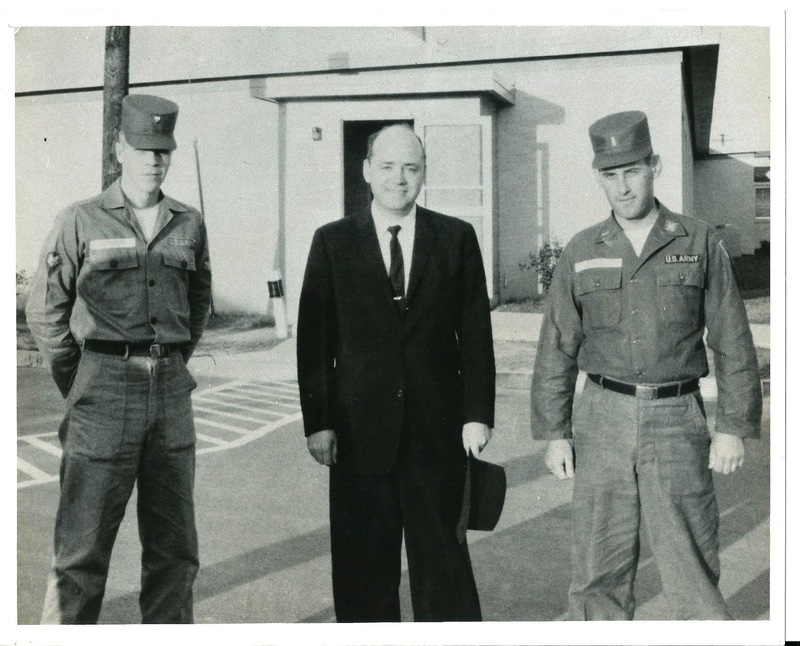 Hoglan, Lt. Lawrence Salburger who was with the unit at Byron and two Chief Warrant Officers . 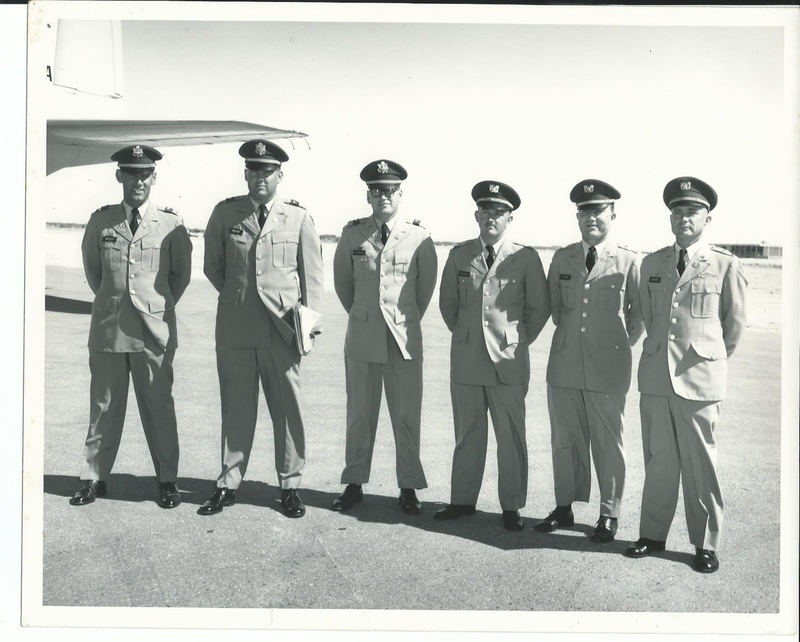 On the far right is CWO Charlie Cane who was assigned to the Jeffersonville site. LTC. Kean (pronounced Kane) was there and I recall our having to make an official visit to his home and the protocol of leaving our calling cards that I had printed just for the occasion. 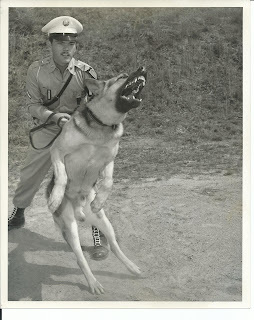 I recall Col Kean was a very friendly person and remembered the wives by name. Steve said that SFC Lucian Muniz really looked after them when they pulled the long shifts." 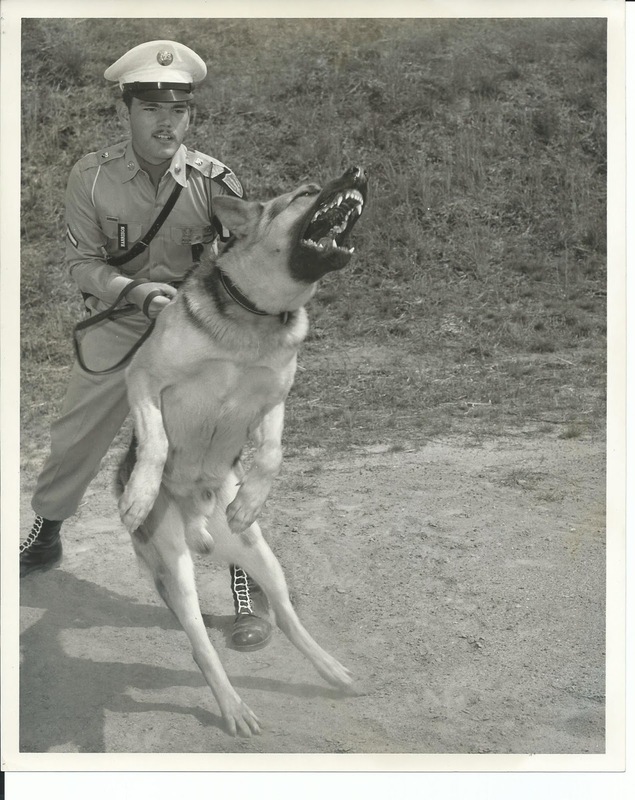 For extra security, German Shepherd guard dogs were on patrol duty. 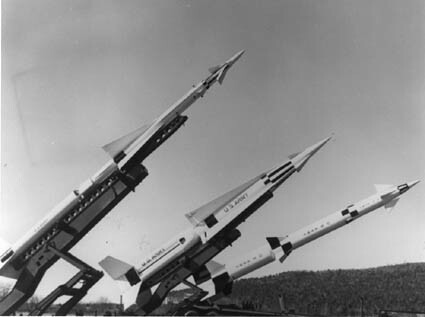 As anti-missile defense systems became more sophisticated, the Nike missile became somewhat obsolete. 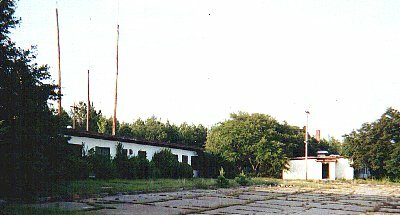 After five years, the base was abandoned by the Army in the first half 1966. 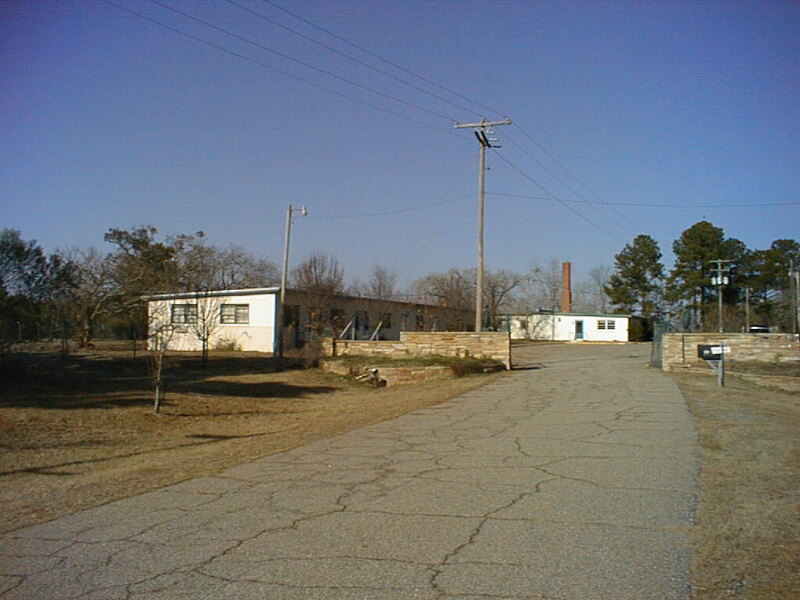 The property was eventually owned and occupied by the Twiggs County Board of Education. Today, the Nike missiles are gone. 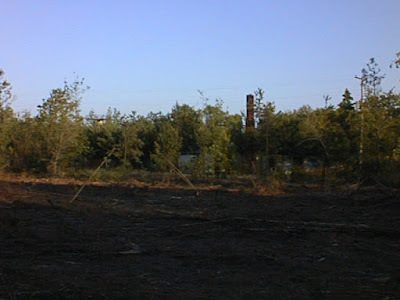 The site was cleared and the warehouse of Academy Sports and Outdoors was constructed in its place. It is indeed ironic that today, there are still Nikes on this site, not missiles, but athletic shoes. Hopefully, we will never see the sight of missiles in our back yard, but for several years all of us took comfort in the fact that the Army was there, protecting us from a foreign attack. * Photos courtesy of Steve and Pat Mercer. * Color photos from Internet posted photographs.